Take your audio project to the next level with Peak Studio. This immensely powerful bundle includes Peak Pro 7 — the latest version of the industry standard audio editing, processing, and mastering application for Mac — plus our highly acclaimed SoundSoap and SoundSoap Pro restoration plug-ins, and the Master Perfection Suite. Also included is SoundSaver, BIAS' new LP and cassette restoration tool, and more. 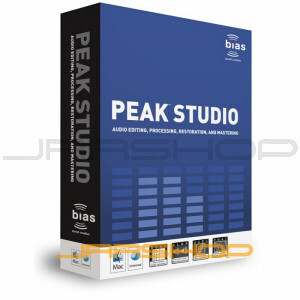 Peak Pro Studio is simply the most comprehensive digital audio production and mastering tool available on the Mac. Peak Pro 7 now features an amazing new Declipper DSP tool designed to repair clipped audio signals. It uses advanced new proprietary algorithms to detect and restore the missing audio content from clipped signals — with jaw-dropping results! Peak Studio integrates special editions of the highly acclaimed SoundSoap 2, SoundSoap Pro 2, and Master Perfection Suite plug-ins — plus a new version of the Sqweez-1 wide band compressor, now with built-in limiting. This wealth of additional signal processing tools make Peak Pro 7 the most powerful version ever! Peak Pro 7 now includes the DDP Export Extension, which allows creation of DDP (Disc Description Protocol) filesets directly from the Peak Playlist! This used to be a $199 add-on for Peak Pro — now included at no extra charge! Peak Pro 7 now offers variable bit-rate MP3 encoding, which allows smaller file size, as well as better audio quality. SoundSaver easily records your audio collection with unparalleled results. Simply connect, record, clean, and export — directly to iTunes, as MP3, or uncompressed WAV files for CD/DVD burning! Archiving your LPs and tapes has never been easier!